Visual and auditory stimuli both occur in the form of waves. Although the two stimuli are very different in terms of composition, wave forms share similar characteristics that are especially important to our visual and auditory perceptions. In this section, we describe the physical properties of the waves as well as the perceptual experiences associated with them. Two physical characteristics of a wave are amplitude and wavelength. The amplitude of a wave is the height of a wave as measured from the highest point on the wave (peak or crest) to the lowest point on the wave (trough). Wavelength refers to the length of a wave from one peak to the next. The amplitude or height of a wave is measured from the peak to the trough. The wavelength is measured from peak to peak. Wavelength is directly related to the frequency of a given wave form. Frequency refers to the number of waves that pass a given point in a given time period and is often expressed in terms of hertz (Hz), or cycles per second. Longer wavelengths will have lower frequencies, and shorter wavelengths will have higher frequencies. This figure illustrates waves of differing wavelengths/frequencies. At the top of the figure, the red wave has a long wavelength/short frequency. Moving from top to bottom, the wavelengths decrease and frequencies increase. The visible spectrum is the portion of the larger electromagnetic spectrum that we can see. As the following shows, the electromagnetic spectrum encompasses all of the electromagnetic radiation that occurs in our environment and includes gamma rays, x-rays, ultraviolet light, visible light, infrared light, microwaves, and radio waves. The visible spectrum in humans is associated with wavelengths that range from 380 to 740 nm—a very small distance, since a nanometer (nm) is one billionth of a meter. Other species can detect other portions of the electromagnetic spectrum. For instance, honeybees can see light in the ultraviolet range (Wakakuwa, Stavenga, & Arikawa, 2007), and some snakes can detect infrared radiation in addition to more traditional visual light cues (Chen, Deng, Brauth, Ding, & Tang, 2012; Hartline, Kass, & Loop, 1978). Light that is visible to humans makes up only a small portion of the electromagnetic spectrum. In humans, light wavelength is associated with perception of color. Within the visible spectrum, our experience of red is associated with longer wavelengths, greens are intermediate, and blues and violets are shorter in wavelength. (An easy way to remember this is the mnemonic ROYGBIV: red, orange, yellow, green, blue, indigo, violet.) The amplitude of light waves is associated with our experience of brightness or intensity of color, with larger amplitudes appearing brighter. Like light waves, the physical properties of sound waves are associated with various aspects of our perception of sound. The frequency of a sound wave is associated with our perception of that sound’s pitch. 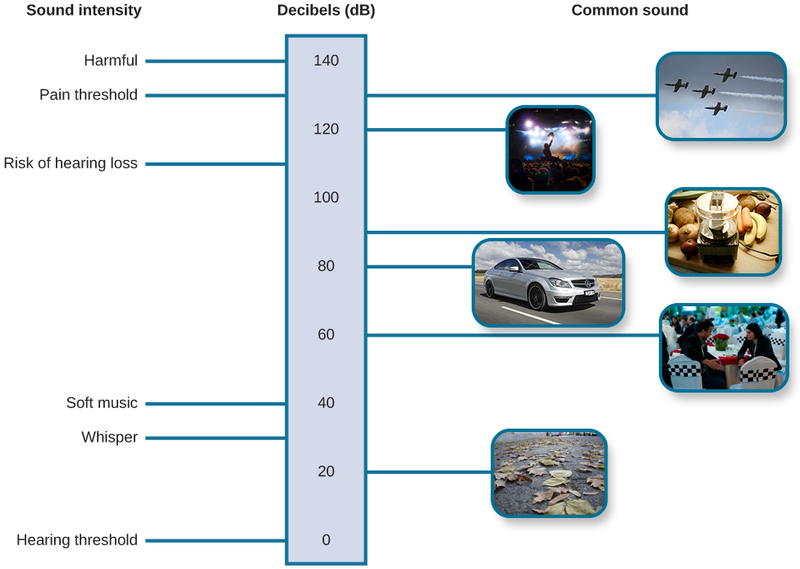 High-frequency sound waves are perceived as high-pitched sounds, while low-frequency sound waves are perceived as low-pitched sounds. The audible range of sound frequencies is between 20 and 20000 Hz, with greatest sensitivity to those frequencies that fall in the middle of this range. As was the case with the visible spectrum, other species show differences in their audible ranges. For instance, chickens have a very limited audible range, from 125 to 2000 Hz. Mice have an audible range from 1000 to 91000 Hz, and the beluga whale’s audible range is from 1000 to 123000 Hz. Our pet dogs and cats have audible ranges of about 70–45000 Hz and 45–64000 Hz, respectively (Strain, 2003). The loudness of a given sound is closely associated with the amplitude of the sound wave. Higher amplitudes are associated with louder sounds. Loudness is measured in terms of decibels (dB), a logarithmic unit of sound intensity. A typical conversation would correlate with 60 dB; a rock concert might check in at 120 dB. A whisper 5 feet away or rustling leaves are at the low end of our hearing range; sounds like a window air conditioner, a normal conversation, and even heavy traffic or a vacuum cleaner are within a tolerable range. However, there is the potential for hearing damage from about 80 dB to 130 dB: These are sounds of a food processor, power lawnmower, heavy truck (25 feet away), subway train (20 feet away), live rock music, and a jackhammer. The threshold for pain is about 130 dB, a jet plane taking off or a revolver firing at close range (Dunkle, 1982). Although wave amplitude is generally associated with loudness, there is some interaction between frequency and amplitude in our perception of loudness within the audible range. For example, a 10 Hz sound wave is inaudible no matter the amplitude of the wave. A 1000 Hz sound wave, on the other hand, would vary dramatically in terms of perceived loudness as the amplitude of the wave increased. Watch this brief video demonstrating how frequency and amplitude interact in our perception of loudness. Of course, different musical instruments can play the same musical note at the same level of loudness, yet they still sound quite different. This is known as the timbre of a sound. Timbre refers to a sound’s purity, and it is affected by the complex interplay of frequency, amplitude, and timing of sound waves. Waves and Wavelengths by Rajiv Jhangiani, Ph.D. is licensed under a Creative Commons Attribution 4.0 International License, except where otherwise noted.